Summer canning season continues. 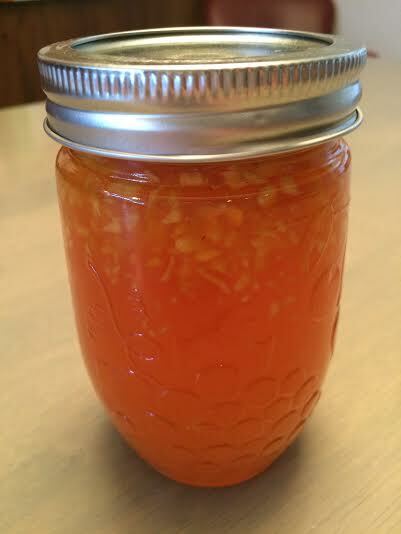 This time, I'm posting this peach jam, despite the fact that it looks like an epic failure. I've made plenty of jam in the past, and this has never happened to me. All of the delicious peachy pieces floated to the top after processing, and it looks, well.....gross. See??! As my youngest would say..... eeeew. Let me assure you that this jam is DELICIOUS! However, I certainly wouldn't give this away. I went to my good friend, Google, to see where I went wrong. I must say, it made me feel a lot better. Apparently this is a really common problem with fruit jam. The most likely cause? I didn't chop my fruit finely enough. It is also helpful to stir the jam mixture occasionally for 5 minutes after taking it off heat, prior to pouring into hot, sterilized jars. In this case, I used my food processor, but didn't want to make it into a complete pulp, so I just pulsed it. Next time I'm going to be more aggressive with that pulse button. It's a shame, because this jam is really, really tasty. Google tells me to stir it all up to uniformly distribute the fruit prior to serving. Sounds like a plan. Next time, I hope to have beautiful, uniform jam. Stay tuned, I'll try again another day. In the meantime, here is a DELICIOUS recipe for Peach Jam. Pulverize those peaches, people. Prepare peaches, and immediately mix with lemon juice to prevent browning. Add sugar, and stir continually over medium heat until boiling. Add pectin. Return to a rolling boil, and cook for 1 minute. Pour into sterilized jars, leaving about 1/2 cm head space. Add lids and rings. Process for 10 minutes, plus additional time as recommended for your altitude. Here's a handy guide. I'm sure it's still delicious! I have never made/canned jam, so pieces or no I'm still impressed! Thanks, Nancy! It does taste great. There's always lessons to be learned in the kitchen and this was a great one for me!